Wowwwwwwwwwwwwwww... This one is amaaaaaziiiiinggggggggg... Esp on you :) And how many more posts coming up today??? Sorry about jamming/spamming the blog feeds..heheheee :D I just wanted to finish up the reviews on this spring collection right away.. I am SO in love with this blush!! It really looks beautiful on you--very natural indeed! I know you're undecided but I'm not--I *LOVE* this on you! :P I like that it's on the subtle side (easier for someone like me--who has a tendency to overapply cheek color--to use) and sans shimmer. The ultra-fine shimmer that is in most Chanel blushes would've been pretty too, but either way, the color is so gorgeous I don't care! 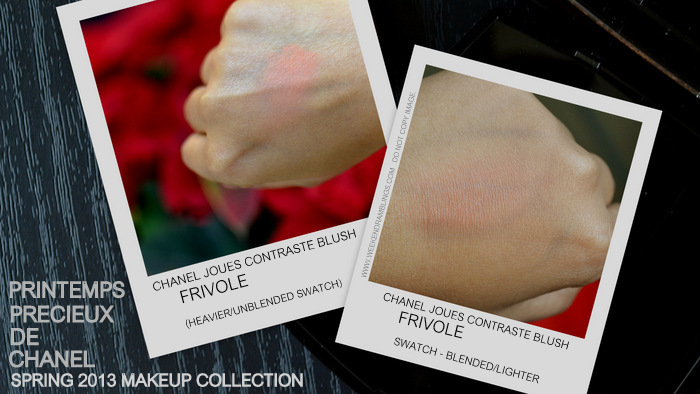 And besides, I really could use more matte blushes in my collection. I was thisclose to purchasing this last week but I decided to do the responsible thing and wait until after Christmas (it was SO hard though! haha). Now that Christmas is over (and I have some gift cards burning a hole in my pocket), this blush is first on my to-buy list, followed closely by the highlighter from this collection.